Based on the bestselling book The Five Dysfunctions of a Team by Patrick Lencioni, The Five Behaviors of a Cohesive Team is a model and development program that guides intact teams through a journey to improve in five areas that are key to productive team dynamics: Trust, Conflict, Commitment, Accountability and Results. The process begins with an online assessment of where the team sees itself against the five behaviors. Here is Patrick Lencioni, author of The Five Dysfunctions of a Team: A Leadership Fable sharing his philosophy on the importance of teams. 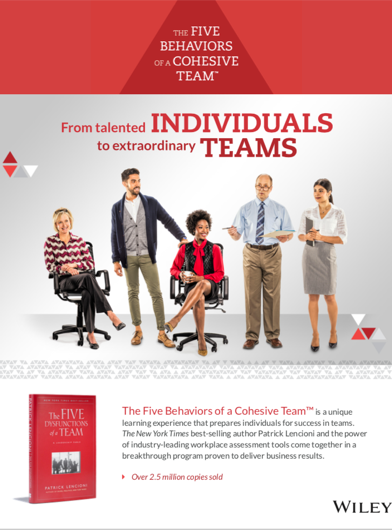 The Five Behaviors of a Cohesive Team begins with an assessment that shares the team’s perspective of their unique strengths and areas of improvement. It’s a tool that evaluates the team’s dynamic across the five fundamental behaviors so members can decide what improvements are necessary for becoming a higher performing team. The assessment also serves as a powerful measurement for growth. By first taking the assessment at the outset of the development effort, the team will establish a baseline for the current state. Then – after the team learns and practices new skills –a re-assessment will provide valuable feedback about where the team is progressing and about where more focus must be placed. The Five Behaviors of a Cohesive team uses a DiSC behavior-style assessment for each team member, to build self- and other- awareness to build understanding and trust. Gaining a better understanding and greater appreciation of each team member’s style gives the team the ability to work together more effectively.